Ths article has already been published (in order of appearance) in German by the Meridian-Fachmagazin fuer Astrologie and in English by the AA Journal. ‘The bounds’ are among the less researched and understood features of the ancient Ptolemaic Table of Dignities. This is something of a paradox when one considers their importance in traditional astrology, especially in horary. 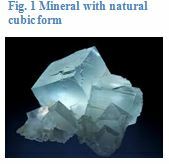 There are several orders of bounds, which further complicates their interpretation. Alexandrian scholar and astrologer Claudius Ptolemy (of the 2nd century C.E.) mentions several systems. This system is nowadays referred to as ‘Ptolemaic bounds’. 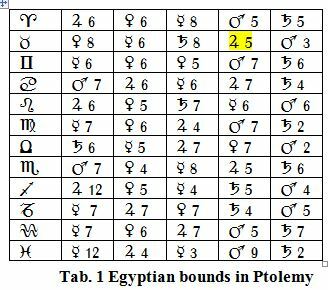 Both the Egyptian and the Ptolemaic table comprise 12 x 5 = 60 characters. (See Tab. 1) There are five dignities for each planet and both systems agree on this. It is noticeable that neither the Moon nor the Sun have any dignities assigned to them, as if they were super partes. 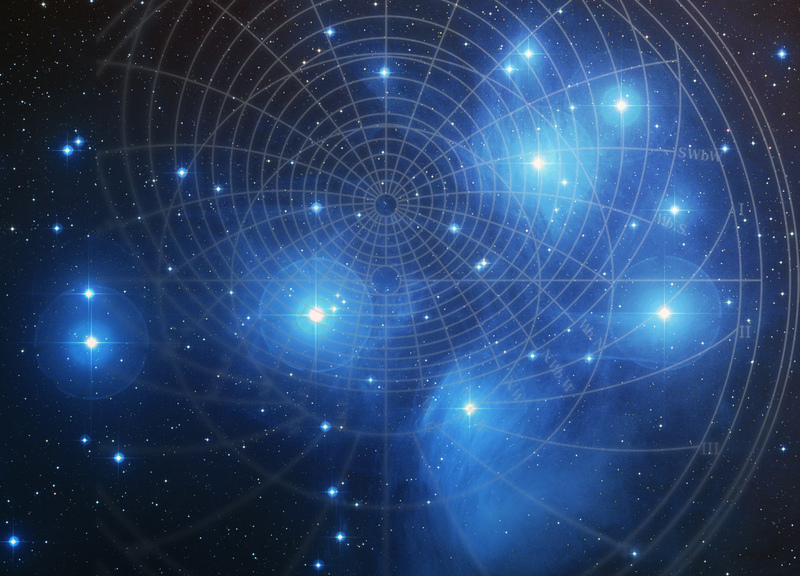 We will start analysing the planetary sequence and after that decode the secret of their numbers. Mercury was less bright than Venus and Jupiter but, due to its closeness to the Sun (maximal distance 28°), its speed and the fact that it was visible sometimes before sunrise and other times after sunset, it was considered androgynous. Thus, the Chaldean order consisted in planetary pairs. One group contained the benefics Venus and Jupiter; Mercury could be both; and the other group was made up of the malefics Mars und Saturn. What immediately catches the eye is that sequence is the same in the first row (from left to right) in both tables. 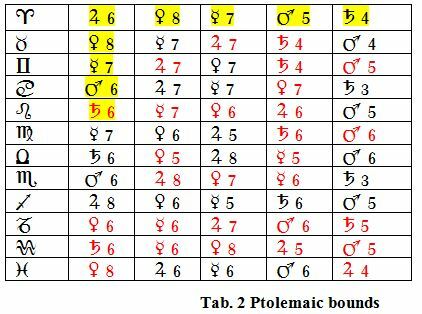 The same sequence has been adopted in the Ptolemaic table also for the first five values of the first column (see yellow marks in Tab. 2 above). This means that the planetary sequence of the bounds is the order of major benefit from the five planets in a sign, decreasing from left to right, depending on the sect (see Tab. 4) and their trigonometrical relationship (aspectual strength). 1st row: shows the strongest planet in that sign. Usually it’s the planet in exaltation (if in sect), but it can also be the domicile ruler or the triplicity ruler (in the case of the Luminaries) in sect. 2nd row: we find onlyJupiter, Venus and Mercury, which are considered benefics or, in the case of Mercury, neutral. These are the strongest aspects/dignities after those in the 1st row. The aspects are normally trines, but only if their rulers are not malefics. Mars and Saturn are excluded as bringers of ‘darkness’. 3rd row: this has to do with the next strongest aspect, mainly sextiles. Here, malefics are not considered either. Jupiter’s aspects are stronger than other aspects. 4th row: one could theoretically suppose that trines and sextiles might be followed by squares. This is not the case. Since every planet governs two signs (except the Luminaries) there are no arch-enemies in astrology. Saturn’s Capricorn squares Venus’ Libra, but this enmity exists only when they differ by sect. Saturn’s Capricorn and Venus’ Taurus get on well together (trine). In this row, Mars and Saturn re-appear, but we also find other planets, especially when the first position is already occupied by a malefic. This row is about the best possible aspect of the ‘less bad’ planet. 5th row: is given to the major antagonist of that element and his ‘kinship’ with the relevant sign of the same sect. The following Tab. 5 shows the attribution of the planets to every sign. Please remember that the Luminaries are not considered at all. As for the number of the terms, when no star is found with two prerogatives, either in the sign itself or in those which follow it within the quadrant, they are assigned to each of the beneficent planets, that is, to Jupiter and Venus, 7°; to the maleficent, Saturn and Mars, 5° each; and to Mercury, which is common, 6°; so that the total is 30°. The attribution of the exact degrees is not comprehensible this way, but gives us suggestions as to where to search. As many of other classical authors, Ptolemy mentions the planetary years. The lesser year is associated with periods between synodic conjunctions which occur in the same part of the zodiac, while the greater year is related to the number of bounds that each planet rules throughout a sign. The authors write that the numbers after each planet in the table (in the colums of the bounds), added together, give the result of the greater year of every planet. The greater years of the single planets added together equal the 360° of the circle. As we have seen, every row in the table equals 30°, the sum of every planet corresponds to the value of his greater years which added together give the value of the circle. The number six is between the pairs 4+5 and 7+8, thus associated with Mercury. The number seven is given to Venus. In Mesopotamia Ishtar/Inanna was often identified with the seven sisters (the Pleiades), as is shown in Fig. 3. The number eight, as the largest number of this sequence and in opposition to Saturn, the greater malefic, is given to Jupiter, the greater benefic. The greater benefic Jupiter doesn’t have any points added. This makes sense. He represents some kind of ideal which cannot be surpassed. Still, he can give his points to one or more other planets. No planet can receive all of his three points, because Venus, Mercury and Mars can accept only one additional point, only Saturn can receive two points, therefore Jupiter distributes his points always on various planets. Venus, the lesser benefic, can lose two points but can gain only one, this way she is never stronger than Jupiter. All planets in their domicile or exaltation get their maximal score in the 1st This is also true for Leo and Cancer, where triplicity ruler Mars and Saturn substitute the sign rulers. In the 1st row, when Venus and Jupiter are not sign rulers or in their exaltation, they are deducted one point (Venus) or two points (Jupiter). A planet in its detriment (opposition) has its maximal point deduction. Since Jupiter has no sign rulership assigned and he is not exalted, he needs to give up two points. Venus and Mercury as the ‘stronger aspects’ receive one point each. Venus is SR and receives an additional point from Mars, who is in opposition, obliged to surrender a point. Jupiter is not SR and a diurnal planet and needs to give a point to Mercury. Mercury is SR and gets one point from Jupiter, who is not SR and is not in his exaltation. 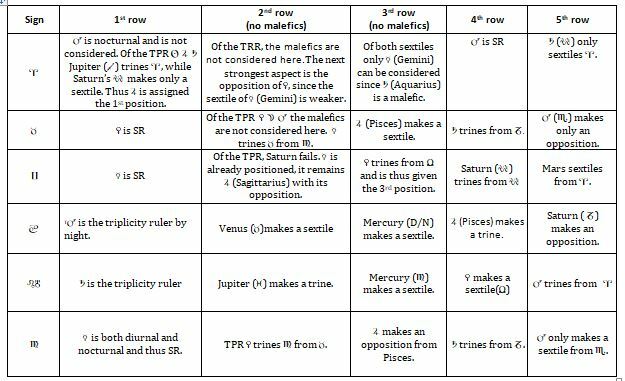 Mars is TPR and gets one point from Saturn, who loses one point being in opposition. Jupiter is diurnal and gives a point to Mercury (D/N). Saturn TPR receives two points from Jupiter, while nocturnal Venus needs to give one point to Mercury. Mercury is SR and gets an additional point from Venus. Jupiter is in opposition and loses his three points. Saturn gets two additional points because of his trine, while Mars can receive only one additional point. Saturn is exalted and receives thus two points from Venus, which is SR but nocturnal. The next position contains a mistake, in my opinion: Since Mars (Aries) is in opposition to Libra, he should be detracted one point, making his score four and that of Mercury seven. Mars is SR and gets an additional point from the other malefic Saturn, who is the weakest in this row. Jupiter is SR and keeps his points. Venus is nocturnal and gives one point to TPR Saturn. Mercury in opposition gives a point to Saturn. Venus is not SR and gives a point to SR Saturn. Jupiter is diurnal and gives to Mars, who is exalted. Saturn is SR and gets two points from Jupiter, who has fewer dignities than Venus, who also receives one point from Jupiter. Venus is exalted and gets one additional point from Jupiter, who is diurnal and thus losing a point in favour of Mars. 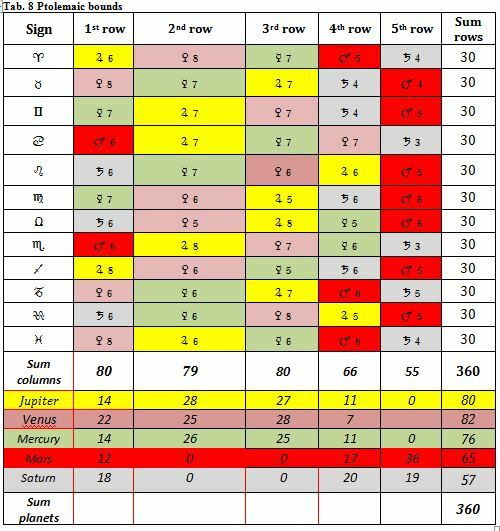 The above explications are clearly evidence of why the bounds have been used for more than 2000 years for the evaluation of the planets’ strength in the signs: exaltations, domiciles, trines and sextiles describe different vibratory levels of a sign and thus to its resonance in the zodiac. The English astrologer William Lilly gave the Ptolemaic bounds in the 17th century the final break, with the success of his Christian Astrology. 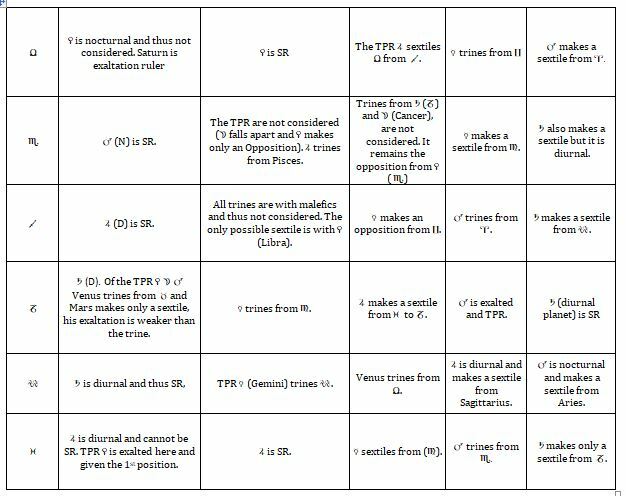 However, he used the planetary sequence as described in Tetrabiblos, but added the numbers from left to right, attributing determined sections to the planets, similar to the Dorotheus bounds. This complicated the logical comprehension of the system immensely. Dorotheus of Sidon, Carmen Astrologicum, Pingree translation, Astrology Classics Publishers, 2003. Vettius Valens (120-175 n. C.) has also worked with other tables, in which Moon and Sun were assigned dignities. These tables are not discussed here. – Claudius Ptolemäus, Tetrabiblos, Melanchthon- Translation (German), Chiron Verlag 2000. – Bonatti, Book of Astronomy,Cazimi Press, 2007. – Lilly, Christian Astrology online auf http://www.skyscript.co.uk/CA.html. – Hephaistion of Thebes, Apotelesmatics, Book 2 On Inceptions, Cazimi Press, 2014. Francesca Rochberg, Babylonian Horoscopes, American Philosophical Society, 1998, p. 10. Guido Bonatti, Book of Astronomy, Cazimi Press 2007, S. 67. Paolo D’Alessandria, Introduzione all’Astrologia, Mimesis, 2000, p. 30.
 http://www.astrologiamedieval.com/tabelas/Tetrabiblos.pdf, p. 33 (Book I, ch.21). See Bonatti, Book of Astronomy,Cazimi Press, 2007, p. 64 and 149, Paolo D’AlessandriaIntroduzioneall’astrologia, Mimesis, 2000, p. 29, Lilly, Christian Astrology online at http://www.skyscript.co.uk/CA.html, from p. 57. The mystics of Pythagorean numbers seem to have nothing to do with this approach. Pythagoras ordered the planets according to their aspects: Saturn as the antagonist to the light was associated with the number two: 360/2=opposition.